"Many who have spent a lifetime in it can tell us less of love than the child that lost a dog yesterday." 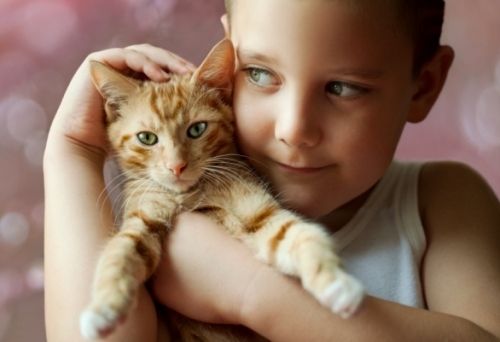 Without a doubt, pets can play a very important part in the life of a child. Depending on the pet and the age of the child, a pet may be perceived as a best friend, a playmate, a confidante, a protector, and even a sibling. Undoubtedly children feel grief including for a lost pet but it can be difficult to understand how they feel and demonstrate this grief; we must remember that grief is an individual experience and that this is also the case as far as children are concerned. Children need support and guidance to understand and cope with their grief and it is essential to respond to each child individually according to their behaviour and perceived needs. Aside from sadness and other grief emotions, some children may feel angry that their friends’ pets are still alive or worried that their friends will make fun of them for being upset about their lost companion. 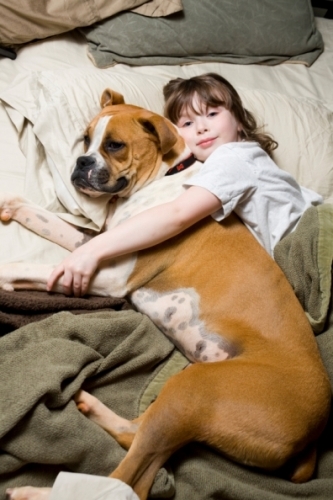 Communication is key to helping children (and adults too) cope with pet loss. 1. Should children be told the truth? Grief is an emotionally very painful experience and there is an argument for trying to protect children from this; to hide the fact that the pet has died until they are older and they have become more accustomed to living without their pet. This can involve for example telling the child that the pet has gone to live with relatives on a farm where he/she can play freely or that the pet has gone on a long holiday. However most people recommend that children that are old enough to understand and reason should be told the truth at the time – either about the death of their pet or indeed about an illness that will eventually cause death. Not telling children the truth can lead to resentment later for being excluded from opportunities to say goodbye to a beloved pet. In addition not telling the child that the separation is permanent can lead to on-going expectations of their companion’s return, or to confusion and guilt about why he/she was sent away. Some children will already have been exposed to the concept of death for example at school or from the television and may surprise you with how much they already understand. However others may not have really understood, or indeed may have misunderstood, what they have previously heard and in some cases the death of a pet will be the first death to which a child is exposed. Therefore telling the child about the pet’s death may also require explaining the concept of ‘death’ to the child. The death of a pet can be one way for children to understand the concept of mortality. A lot of advice is available on how mortality can be explained in an honest but simple way that the child will understand. Will we see him/her again? Has he/she gone to heaven/to be with God or the angels? You should try and answer these questions as honestly as possible; providing enough detail to satisfy the child but without over-complicating your response. Don’t be afraid to say ‘I don’t know but mummy/daddy likes to think…’ and answer freely according to your religious and spiritual beliefs. Also don’t be afraid to share how you are feeling with your child and remember to explain that animals age more quickly than humans do and typically have a much shorter normal life-span. Telling children the truth and allowing them to grieve openly sets a good precedent for other bereavements or emotional distress that they may suffer in the future. They will also come to realise that most things feel better and less painful in time. The use of the phrase ‘put to sleep’ may not be appropriate when describing euthanasia to children as it may result in confusion and fear about their own sleep or that of other family members and potentially make bedtime problematic. 2. How does the age of the child affect what I do? Two to three year olds do not have the life experiences to give them an understanding of death. They should be told the pet has died and will not return. It is important that they be reassured that they did not do or say anything to cause the death. Children at this age may not understand what death really means, but they will sense and copy your emotions and behavior. Note that it is good to cry and show your own feelings of grief, but these must be controlled and perceived as a normal response to the loss of a loved one. Extra reassurance, as well as maintaining usual routines will help the child. At this age one will usually accept a new pet very easily. Children of this age group usually have some understanding of death but may not comprehend the permanence of it. They may even think the pet is asleep or continuing to eat, breathe and play. They may also feel that past anger towards their pet, or some perceived bad behavior was responsible for its death. Manifestations of grief may include bowel or bladder disturbances as well as a change in playing, eating and sleeping habits. Through frequent, brief discussions allow the child to express feelings and concerns. Give extra reassurance. Drawing pictures and writing stories about their loss may be helpful. Include the child in any funeral arrangements. Children in this age group know that death is irreversible. They do not normally think this might happen to them, but they may be concerned about the death of their parents. They are very curious and may ask questions that appear morbid. These questions are natural and are best answered frankly and honestly. At this age they may manifest their grief in many ways, such as school problems, anti-social behavior, somatic or physical concerns, aggression, and withdrawal or clinging behavior. As with young children, it is important that they be reassured that they did not do or say anything that caused the death. Children in this age group are usually able to understand that death is natural, inevitable and happens to all living things. They often react to death in a manner very similar to adults, using their parent’s attitude as their model. A pet’s death can trigger memories of previous losses of any kind, and this should always be open for discussion. This generalized age group reacts similarly to adults. However, the typical adolescent span of expression can range from apparent total lack of concern to hyper-emotional. One day they want to be treated like an adult, and the next day they need to be reassured like a young child. Peer approval is also very important. If friends are supportive, it is much easier for them to deal with a loss. Also, keep in mind that an adolescent is trying to find his or her own true feelings, and may be prone to conflict with a parent on how to express feelings and grief, at this time. It is important to avoid antagonisms over this. 3. How can I help my child express and come to terms with their grief? Encourage the child to tell you and draw pictures of where they think the pet has gone, who else is there, what the pet is doing etc. Depending on the child’s age, ask them to choose some words from a list to show how they feel: a suitable list might be…. In addition, try to involve children as much as possible in other possible ways of memorialising your pet – please see Ways to memorialise your pet and Family-friendly ways to memorialise your pet. Depending on the age of your child, it may also be very helpful to them to complete this Remembering a Beloved Pet sheet from Kidlutions. Kidsgriefrelief.org and the Childhood Bereavement Network are excellent resources to help children through bereavement. 4. What other considerations are there? The first additional consideration is how the loss of a pet can affect the day-to-day functioning of the family and the household due to bereavement and changes in routine. New routines may need to be created and these should be discussed with everyone in the family; children will need to be supported as they become used to the changes. The second additional consideration is that it is important to make sure that all other people involved in the life of the child (e.g. school staff, childminder) are aware of the loss of the pet. Along with parents, these other caregivers are also well-placed to support the child and monitor him/her for signs suggesting that he/she may not be coping adequately with the bereavement; such signs include poor attention in the classroom, changes in behaviour or loss of appetite. More advice on how to help children cope with pet loss can be found in some of the books listed on the Ralph site and there are also books specifically written for children. This is a good blog post about helping children cope with pet loss by Sue Atkins, The Parenting Expert.